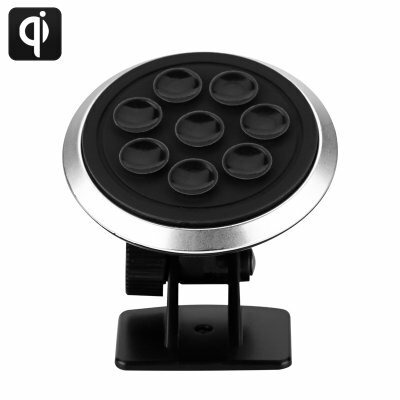 Successfully Added Qi Wireless Car Charger - Qi Complaint Charger, 72% Efficiency, 360 Degree Rotatable, Non Slip 9 Suction Cup to your Shopping Cart. Complaint with Qi charging standards this mini wireless charger work directly with a range of devices such as Samsungs S6 / S6 Edge / Note 5 and Nexus phones as well as devices from Nokia, LG, HTC and a huge range of other Qi-enabled devices. A great little charger for your home office, workplace or vehicle this mini Qi charger has 9 suction cups so it can keep a firm hold of your phone as it charges. This ensures that even on the bumpiest of roads that this Qi wireless charger will keep a firm grip on your phone Simply set it up wherever is most convenient for you with the adhesive pad on its base and then tilt and rotate the head to find the perfect angle for your needs. Powered via a USB cable this Qi charger is up to 72% efficient and take the hassle out of charging. With this stylish Qi charging dock the power transfer takes place via magnetic induction so there's no need to plug in your phone each time you wish to top up the power. This Qi Wireless Charger comes with a 12 months warranty, brought to you by the leader in electronic devices as well as wholesale Qi wireless chargers..